Power plants have refractory requirements for most projects or outages. Most often they are limited in nature and only require a small paddle mixer, pan, or tub to mix the material amounts needed. When a refractory boiler project exceeds the labor crafts’ expertise, or large volumes of refractory materials are required, the refractory work is usually subcontracted. Outside sourcing would be required, for example, if the refractory material is to be pneumatically applied, shot-creted, or pumped. Good subcontracting practices must be enforced from the design level to the finished product, beginning with a best-practice approach and including clear contract documents. It must convey to the installing contractor or personnel, clearly and without exception, the intent of the specification. It must provide the information necessary for the installation to proceed. It must list only the elements contractually required for proper installation and supply of the refractory as defined by the scope (quantitative take-offs and drawings provided)—that is, it does not state what is not required. It must establish proven standard methods of construction. The Refractory Contractor shall perform all phases of work and supply all materials required in an acceptable manner as shown on the drawings and documents submitted with these specifications. The quantitative takeoff provided with these specifications is intended as a guide solely for the purpose of defining the scope of work. It will be the Contractor’s responsibility to verify material types and quantities. Materials furnished by the Contractor shall be unloaded, stored, and weather protected by the Contractor until applied. The Contractor shall furnish all supervision, labor, tools, and equipment–including, but not limited to, compressed air, scaffolding, dry storage, office, and change room facilities necessary to install all materials furnished under these specifications. Potable water, tap water (non-potable), and electricity for construction purposes will be made available to the Contractor by the Company. The Contractor is to supply extension cords, lamps, water hoses, and any other equipment needed to complete the work. The Contractor shall furnish all material and labor necessary to fabricate, install, and remove any forms that may be necessary to properly apply or install the materials. No materials that are used or furnished by the Contractor in connection with this scope of work–including, but not limited to, all insulation materials, cements, gaskets, packing, roping, etc., shall contain any amount of asbestos. All materials being furnished under this contract must be asbestos-free. The Company shall reject any and all asbestos-containing materials. The Contractor is responsible for the correct installation of the installed refractory. Installing Contractor (or manufacturer) is responsible for providing a proper material dry-out procedure for the refractory material installed. Refractory materials must be thoroughly dried to reach their proper strength. Refer to contract requirements of dry-out responsibilities and schedule. Installing Contractor may be responsible for providing the dry-out services for the refractory material installed. Check contract scope requirements for more information pertaining to dry-out responsibilities. Final approval or acceptance of the installation by a Company inspector or representative does not relieve the Installing Contractor of any responsibility, warranty, or guarantees for a proper installation. The Company’s premises must be kept reasonably clean during construction and left broom clean prior to Contractor’s leaving the job at completion. Installing Contractor, after award, shall submit a bill of materials listing the quantities and sizes of the materials required to complete the refractory requirements. This bill of materials should include the material manufacturer’s name and extra quantities included for wastage. The quantitative takeoff provided with this specification does not relieve Contractor of the responsibility to verify quantities or types of materials being provided. No chrome or non-chrome-containing refractory shall be replaced with a chrome-containing product. Hexavalent chromium is a carcinogen and can cause numerous health hazards. Inhaling dust from a hexavalent chromium material increases the risk of lung cancer. No coal tar-based products can be used as parting agents. Installing Contractor is responsible for curing installed refractory material. Cement-bonded refractory materials must be cured for a minimum of 24 hours by the Installing Contractor. The term “curing” means keeping the installed refractory material wet or the surrounding atmosphere humid to create the most favorable conditions for the completion of the chemical reactions of the cement. Curing results in improved strength and allows the refractory material the potential for reaching its proper strength after dry-out is performed. This will permit proper strength development before starting air drying or application of heat (dry out). Installing Contractor is required to properly vent the surface of installed phosphate-bonded refractory materials (if applicable). Vent holes should be placed on 6- to 9-inch centers. The surface of the plastic material should be covered, kept from drying out, and protected from freezing. Phosphate-bonded refractory materials must be cured and dried at the same time. A phosphate-bonded material must be cured and dried within the first 2 to 3 weeks after installation. Installing Contractor is responsible for ensuring that the right amount and type of water is used in mixing the refractory material. Installing Contractor is responsible for ensuring that the proper mix time is followed, based on the refractory manufacturer recommendations and site conditions. Installing Contractor is not permitted to remix or re-use previously mixed or installed refractory. Installing Contractor is required to wear protective equipment (masks, gloves, protective clothing) when mixing, installing, or removing refractory material. The quantitative takeoff provided with these specifications is intended as a guide solely for the purpose of defining the scope of work. It will be the Contractor’s responsibility to verify material types and quantities. gun (dry or wet), ram, or conventional (cast, pour, or trowel) applications. temperature of the stored material must be kept between 50°F and 90°F. must be ventilated with air holes to prevent condensation forming on the inside of the tarp or plastic sheeting. No refractory material should be used if the manufacture date of the refractory is longer than 12 months for general seal application. For refractory intended to be used in high-temperature and/or corrosive areas (cyclone burners and furnaces, ash hoppers, or seals inside the boiler or furnace), the manufacture date of the refractory material should be less than 3 months. 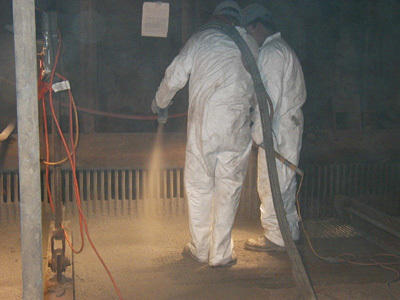 Prior to installing the refractory, all surfaces must be dry, clean, and oil free. 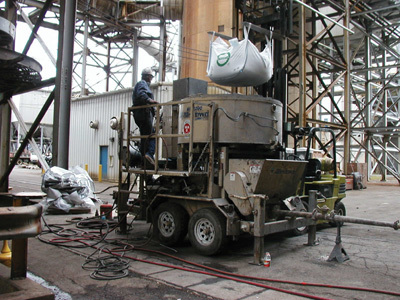 Any grease or loose mill scale must be removed prior to applying refractory. If sandblasting is required to remove rust, loose mill scale, or other foreign materials, sandblast shall be a brush-off blast cleaning only in accordance with SSP-SP-7-63. After sandblasting, the surface should be cleaned with an air jet. It must not be washed with water, as this may cause rusting of the surface. The final refractory mix temperature must be between 50°F and 90°F, or it cannot be used. Different refractory materials should not be mixed together. Mixers should be thoroughly washed before and during the course of the day, during the course of the work shift, to prevent build-up of refractory materials inside the mixer. potable water should be used when mixing refractory. Other types of water may contain industrial compounds, salts, or minerals that can easily contaminate a refractory mix and seriously impact its performance. Refractory materials, in most applications, must be prewetted before mixing. Check with refractory material manufacturer for recommended prewetting instructions. Refractory material may not be used if the time duration from mixing to installation exceeds manufacturer’s recommended “pot” life span. Pot life span is set by the manufacturer and refers to the amount of time from when a refractory material is mixed to when it is applied. This can vary from as short as 15 minutes to as long as 45 minutes, depending upon the material. 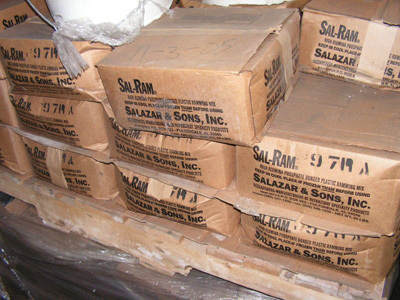 Refractory material must be properly cured for a minimum of 24 hours and protected from freezing. Phosphate-bonded refractory may require venting and be dried within 3 weeks of installation. Installing Contractor shall mix only as much material as can be used with the time period of the pot life of the refractory material. Forms, when required, must be watertight and suitably braced, and should be left in place until the refractory material has hydraulically set. The forms should be painted or coated with an approved parting agent. Either metal or wood can be used as a form material. Installing Contractor is responsible for any expansion requirements, and these should be incorporated into the refractory seal during the installation. A 1/8-inch minimum expansion should be place every 10 feet to assure proper expansion of the seal. Installing Contactor shall thoroughly work into place all refractory material and shall remove, by rodding or vibrating, any internal air bubbles. This can be done using an electric rodder or drill on the outside of the forms. Smoothing or finish troweling of the refractory surface must be avoided. The surface of the refractory should not appear smooth (like concrete) and can be finished with a curry comb, if desired. The equipment and set-up for gun application should be determined by the installer and should be based on the size of the installation and the gunning material to be installed. It is recommended that the Installing Contractor check with the gunning machine manufacturer to ensure compatibility of the rotor being employed with the refractory material being gunned. All operation and maintenance of the equipment should be done in accordance with the manufacturers’ specific instructions. Plant air can be used, but the air volume and pressure must remain constant and uninterrupted. When work is stopped at any time before completion, all plastic refractory (if applicable) must be covered with a moist paper or sacking material. For installations that require 5 days or more, the wall should be covered with a polyethylene film or plastic material. If there is an overnight interruption on the ramming, the top 2 inches of the wall area should be cut off and thrown away prior to installing new plastic refractory material. A well-written specification (and bid package) protects both the subcontractor and end user by preventing installation problems or misunderstandings. Subcontract packages based on the best practice approach to subcontracting, including a well-written specification, have the best chance for a proper, longer-lasting refractory installation.